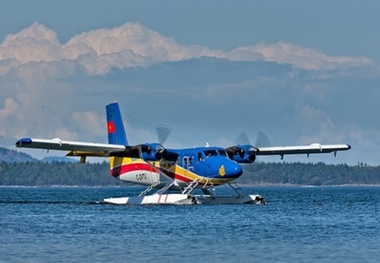 Ha Quang Long, director of Quang Ninh's Culture, Information and Tourism said seaplane service in Halong bay is a creative idea, contributing to attracting more tourists to Halong. Travelling by seaplane, visitors can save travel time from Hanoi to Halong and also have a chance to behold the panorama view of Halong bay on high. This service is provided with Cessna Grand Caravan from US, the plane has maximum capacity 12 passengers, average speed 300 km/hour, the seaplane can take off and land on ordinary airport or water surface in the sea, river and lake. With the completion of legal procedures and permits for the first flight Hanoi to Ha Long and arrangement of pilots including 1 international captain 1 Vietnamese pilot trained in Australia, the seaplane service is expected to put into operation in September and the transport company also plans to buy more aircraft in the future. At the moment the fastest way to travel from Hanoi to Halong bay is by helicopter, tourists will start the trip from a military airport in Hanoi and reach Halong city in 45 hour. Air taxi service was introduced by Northern Flight Service Company in order to serve the needs of travellers who have little time and prefer some convenience. Helicopter service to visit Halong bay was launched in 2008, it cost aprox 550 usd/person (round trip) and 350 usd/person (one way). Halong sightseeing fees is 110 usd/person.